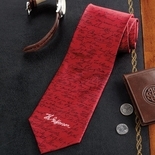 Elements from Jefferson's manuscript and early printed versions of the Declaration of Independence adorn this striking necktie - along with a town crier who could be broadcasting the news of its completion. Also includes wording from the Constitution. Hand-tailored pure silk. 3 7/8" wide.